This is where you will be able to follow our trip as we travel through France and Spain ( albeit that part quite quickly) and into Morocco… in our wonderful Motorhome…. The run down through France and Spain will be a long haul over 3 days …but it has to be that way,…. 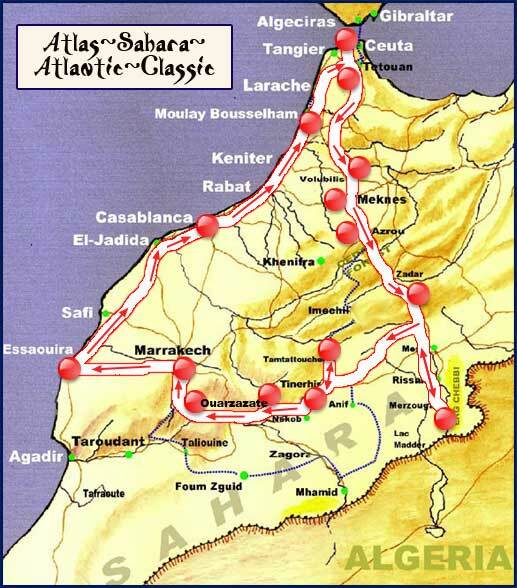 This is the route we are due to be taking in Morocco…..
About to leave to Morocco. All arrived in Spain and about to leave for the ferry. Hoped to put a few more posts on line during the trip down but was pushed for time…. Safe to say it was a non eventful trip, as normal when driving in France and Spain, much quieter roads make it so much easier. Stopped at the Aire by the Eurotunnel ( French side) … Motorway Aire near Pons, camp site 40 Kms north of Madrid and a second camp site in Granada. 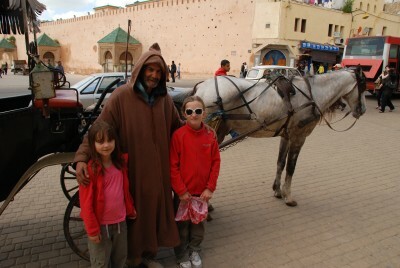 We are now in Morocco….. The crossing was something else..It appeared total chaos…. But there was a system.. I think! 1 hour later and we managed to clear all the check points. Ray earned his fee for that part alone. 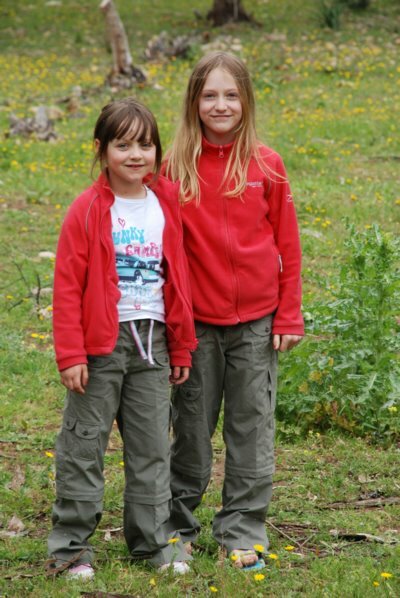 We went off to the town to change our money and then to the beach where Chloe and Amy had a swim… albeit the water was not very warm… Having collected several kilo of shells we returned to the Motorhome and ate at the site restaurant. 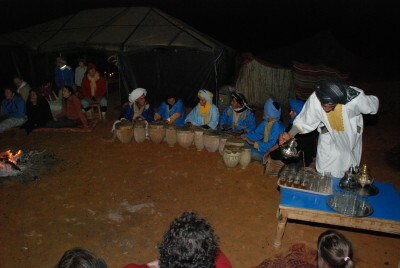 Today, Thursday, we had a 9.00 start and then via a supermarket we drove to the camp site at Chefchaouen. The route was through some of the Rif Mountains… it was much greener than we thought it would be. Very beautiful. 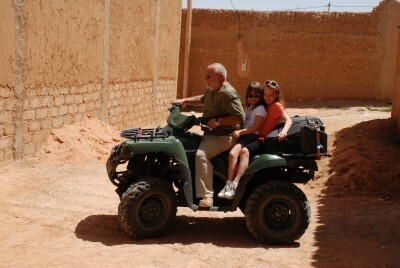 We also came across our first Moroccan driving….. ! We had a short brief with Ray ( the tour leader for those unaware) and then walked down to the village…; with blue building… Very pretty. Stopped in the main square for a Mint Tea. Never had a real one before and will be having many many more I am sure. 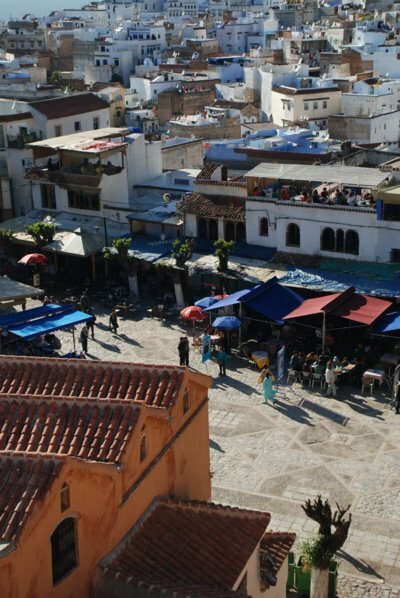 Visited the Kasbah which gave a good view of the town square. Grand taxi back to the site for just 30 Dirham ( two pound fifty or there abouts) ….well it was a steep hill back! And with a sane driver. We have all had great fun and Chloe and Amy are having a great time. 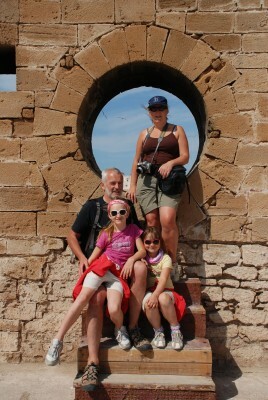 Hope to put up some photos soon but not tomorrow as we are wild camping at Volubilis near to the Roman ruins. 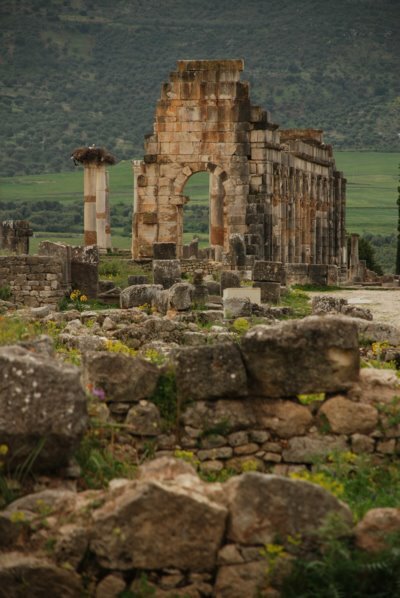 We left Chefchaouen and made towards a wild campsite near the Roman ruins at Volubilis. The roads started to get a little rougher and at some points all there was was a vehicle’s width of tarmac in the middle and gravel either side. We stopped at a cafe for lunch where you see the meat cut up by one Moroccan and then it is cooked by another before being taken into the cafe to eat. Really nice lamb chops and Kefta. The campsite is a wild site in a wooded area. A problem for a couple of our vehicles but nothing insurmountable. The girls helped with collecting logs for the camp fire. 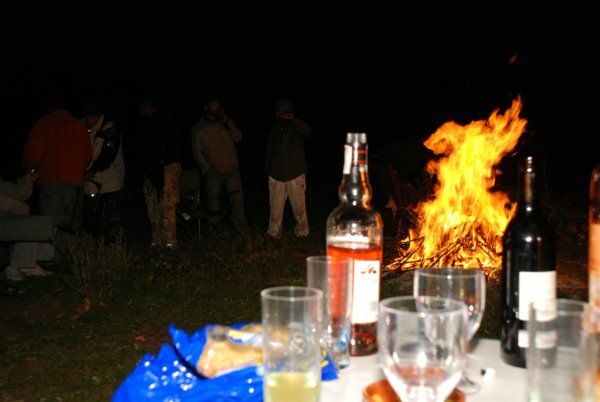 Once the fire was alight everyone soon gathered around with a drink or two…..and hot spuds…. No too an early start (8.45) as we drove off to the Roman ruins…. We had an English speaking guide take us around the various houses and streets, impressive. Having left Volubilis we had about an hours drive to the campsite at Meknes which, again, is basic but this is Morocco and not the Caravan Club. It can be seen though, that at one point this was a really nice site. The site is in the town only a short walk to the souks and square. Meknes is just great… we wandered around the Souks and markets on the first day getting a few spices and such like. The market was very busy – the description of it being like Ikea on a Bank Holiday was pretty spot on! The girls were not too keen on the meat area – the standing joke was that the meat was so fresh any good vet could have revived its owner. But it was all part of the experience. 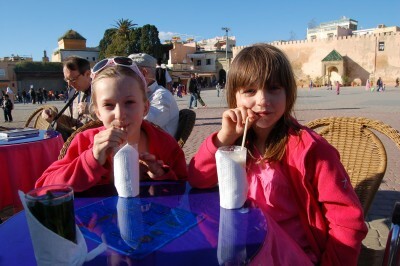 The girls enjoying their banana juice in the main square – a great place for sitting and just watching the world go by! The second day we had a horse and cart ride around the town which included going through the market street – stalls were literally being moved out of the way to let us through. Going back to Ikea – it was like pushing the biggest possible trolley in the opposite direction to everyone else! The girls with Ahmed, our slightly mad driver! Managed to buy a breathable mat for alongside the Motorhome (much cheaper than the UK…). After two nights in Meknes we headed for the Cedar Forest in the Middle Atlas just after the town of Azrou for another night of wild camping. The forest is home to Barbary apes some of which have no fear of humans – especially those with food! The campsite. Very beautiful although at almost 2000m it was a little cold and we even had to put the heating on for a while! Collecting wood again and preparing the fire. Snowball fight! A little into the trees there were patches of snow left from the winter. Each day’s travel has shown us new sights. Travelling from the cedar forest of the Middle Atlas mountains we passed through the eastern edge of the snow covered High Atlas range before moving down to the edge of the Sahara. The scenery is breathtaking and constantly changing. Of course the girls have missed much of this as they have been too busy singing (that’s using the term very loosely!) along to their iPods but even their slightly off key singing beats a continual chant of “are we nearly there yet?”! We climbed to a height of around 2100m before descending to about 1000m travelling along some windy mountain roads. Thankfully with the drivers’ strike, the roads were fairly quiet the journey was fairly easy. One of the numerous kasbahs we passed. 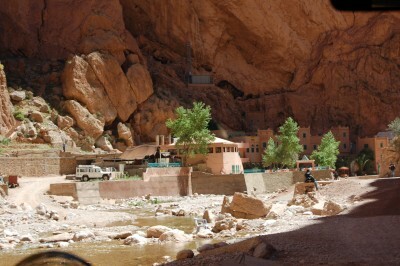 Much of this part of the journey was alongside the Ziz river which has carved massive gorges in the rock. The campsite at Meski was on the site of a naturally occurring spring – the pool was OK to swim in providing you didn’t mind sharing it with fishes and frogs. However the girls decided it was too cold to swim in so we gave it a miss and just dipped our toes instead. We paid a visit to the local school. The school is very close to Ray’s heart and we all bought donations of clothes and basic equipment such as pencils and paper with us. 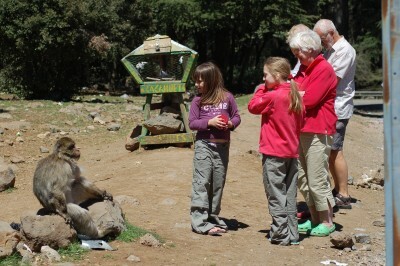 It was quite an experience for the girls whose biggest hardship at school is having to share a laptop. The girls had bought some of their own school pencils with them and after the teacher had introduced them and the class had sung the spelling of their names to them in Arabic, they gave one to each of the children in the class. Above the oasis where Meski sits. Us! The campsite here is in an oasis – it is a lush and very green spot. 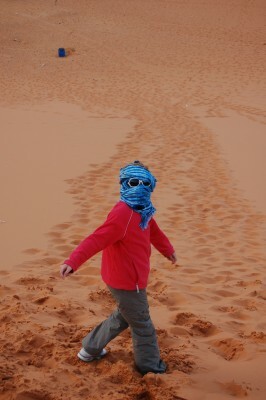 After the lushness of Meski we headed off to the Erg Chebbi dunes in the Sahara for a three night stay at the Auberge Cafe du Sud, originally a French Foreign Legion Fort. 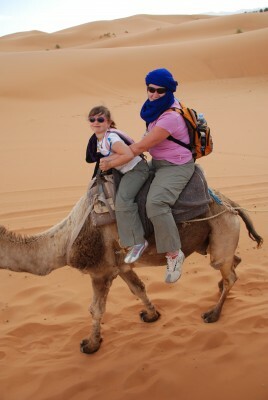 Part of this stay included a 90 minute camel ride into the dunes for an overnight stay at a Berber camp where we would be able to see a spectacular sunset and then get up early to watch the sunrise. Well that was the plan…. The guidebook says there is on average one day of rain in this area and guess what day it happened? So although we got to see a bit of a sunset we were all quite excited by the following thunderstorm and lightning show! 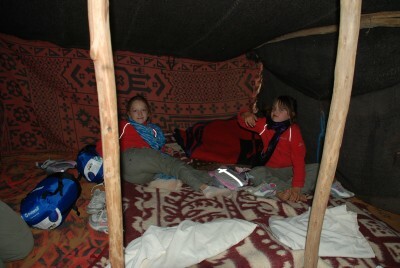 However we then realised that the tents were nothing more than large blankets and the rain was getting in. Luckily it was only a short sharp shower and our overnight bags hadn’t got too wet. After a surprisingly comfortable night we were up at 5.15am to get back on the camels for our not so comfortable ride back to the Auberge as the sun rose. We all agreed that although it had been a good day and night out, none of us were in a rush to get back on a camel again anytime soon! One day snowballs and a couple of days later, the desert. 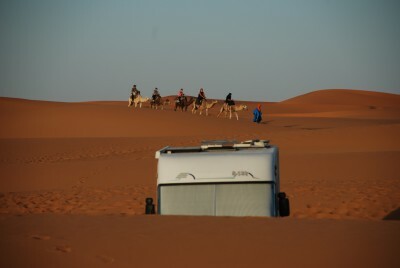 We think we managed to take away a large portion of the desert judging by the amount of sand in the van and our clothes! Our luxurious accommodation in the desert. Yes the scarf may look silly but with the wind and the sand it was needed! Chloe – is that you??? A camel train. All ideas of the desert being deserted were soon put to bed – it was more like Kings Cross at rush hour. On Saturday night all the locals come out as well and sit on the dunes to watch the sunset. Chloe watching the sun through a telescope. One of the guys on the trip is a keen astronomer and had bought some of his equipment along as the desert is a great place to look at the stars ….assuming that there are no clouds around of course! We left the Sahara and travelled along one of the main routes to the south of the Atlas mountains, our destination being Camping Le Soleil, somewhere between Tinerhir and the Todra Gorge. 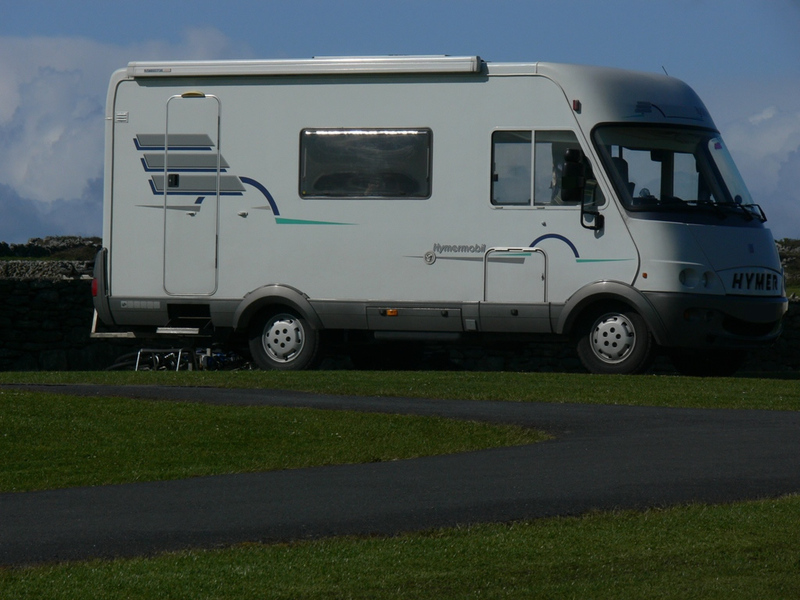 The campsite was by far the best we had stayed in so far – they even had a washing machine(! ), and the girls made the most of a swimming pool on site. We were given the option of an extra day here or moving on to a more basic site in Ourzazate and because a couple of us were suffering with dodgy stomachs we decided to stay. The extra day gave us a chance to relax – you can’t describe this trip as a real holiday, and recharge the batteries before Marrakech. 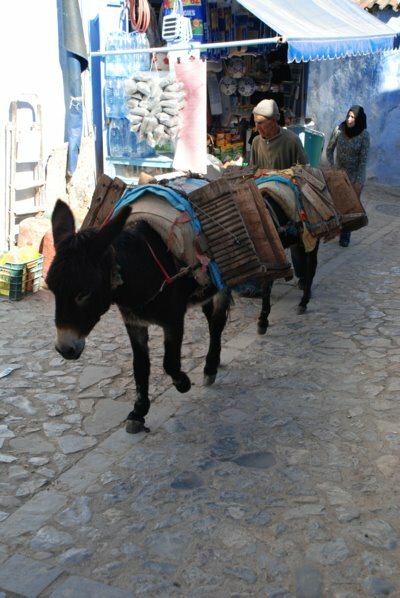 The old and the new – we find ourselves sharing the road with donkeys, horse and carts and all forms of transport. But wherever we have gone we have been given a smile and a wave. The campsite. A beautiful place to stay surrounded by soaring red sandstone walls. The extra bonuses being an electricity supply that didn’t fail and our own water supply! The girls enjoying some downtime. They have been so good on the trip going wherever we’ve dragged them and the extra day here gave them some time to do what they enjoy. Further up the camp were some rabbits so if they weren’t swimming then they could be found feeding them. 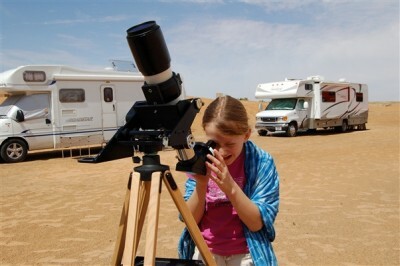 Chloe also had another astronomy lesson that night – we’re waiting for the request for a telescope! Before moving on we went to Todra Gorge. We could go on about the geology of the area but won’t (we’ll put up a separate website when we get back for those interested as the whole trip has been a geologist’s dream) – all we will say is that it is stunning. The gorge narrows to around 20m with walls of 300m. With our other hobby being geocaching, we moved further along the Gorge and after Bob had scrambled halfway up the side of the gorge, we claimed out “first to find” with a cache that had recently been placed there. There are some great places to stay in the area. Unfortunately the internet access was not all that we expected, be so the blog is being finished from the comfort of home. After four weeks in the van our little 2-bed cottage seems like a mansion and the joy of having a washing machine and hot water without having to queue for it cannot be put into words! For those interested, we’ll post another update with a link to the photos – we promise we haven’t uploaded the 3000 or so that we took, and our thoughts or what we could have done to make the trip easier. So onwards from Todra which now seems such a long time ago…. All fully recovered, we left Todra and made our way to Ouarzazate along the road which was surrounded by ancient kasbahs and then through the Vallee des Roses, stopping to buy local rose based creams and lotions. 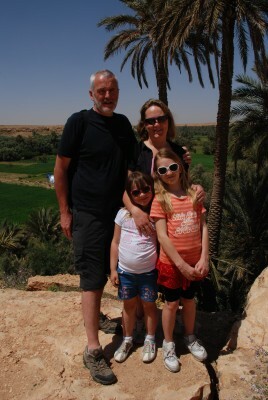 This was a brief stop for us before heading back over the Atlas Mountains. We caught up with the rest of the group for dinner that night (our first restaurant that was licensed!) and Chloe joined in the dancing again. 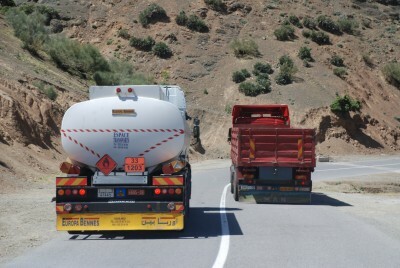 Our next stop was Marrakech but before that we had to pass through the Atlas Mountains again – this time via the Tizi n’ Tichka pass (or chicken tikka pass as it became known!). We weren’t travelling in convoy this time as the road was narrow and 14 vans would cause quite a hold-up – the Moroccans are not the most patient drivers and we saw some REALLY hairy driving on the trip. one of the other couples into examining what was lying on the floor! From there it was up into the mountains to a height of 2260m and then back down via the pass. The drive was spectacular along a narrow winding road through numerous hairpin bends. Asides from the scenery the most memorable part of this trip was lorries coming in the opposite direction with cows and sheep perched on the top above, what to us would be, the usual size load. Oh, and along this road was another cache and as we had only picked up one on this trip we stopped to find this one as well. It was a case of pulling into a small layby and hoping that nothing too big came around the bend! 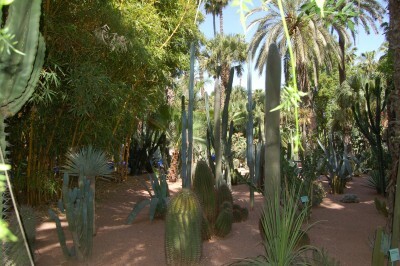 And then Marrakech – a total contrast to anything we had seen already and words probably cannot do it justice. The campsite was some 10km from the city center which was probably a blessing at we were able to escape for some peace and quiet! We joined a guided tour of part of the city in which we saw Le Jardin Majorelle (recently owned and renovated by Yves Saint Laurent before he died), the Bahia Palace and the Saadian Tombs. During the tour we also had a brief introduction to the souks and the main square Djemaa El Fna. The guide obviously had a deal with one of the local herb shops and we were ushered in for a talk and massage – very reasonable at under £2 for neck and shoulders, before coming out laden down with various creams and oils! After a brief supermarket visit it was back into the city to experience the square at night. Throughout the day and night the square is home to entertainers – snake charmers, storytellers, musicians, and the atmosphere is electric. 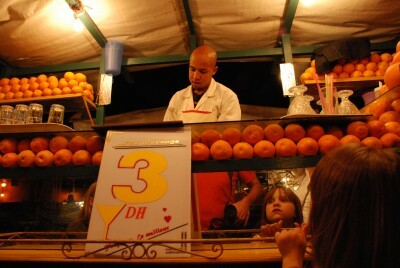 We had freshly squeezed juice from one of the stalls before taking a walk around the food section. Here people come at you from all directions to encourage you to sit at their stall and the choice of food was something else – tanks full of snails and even the choice of sizes of sheep heads! The smell however was wonderful but after a huge lunch we weren’t hungry so we just grabbed an ice cream before heading back to the camp. The next day we were on a mission to shop much to the girls delight! We first went to a government shop which sold every type of souvenier you could want but at a fixed price. 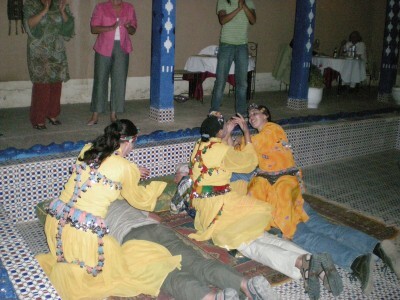 After that and another juice it was into the souks proper and Bob really got into the bartering. Laden down with shopping we came back to the camp for a few hours relaxation. 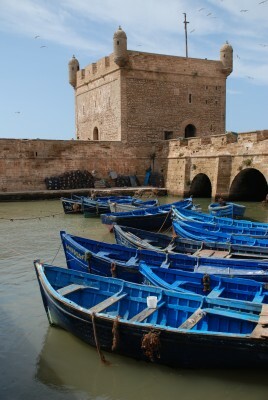 From Marrakech we moved on to our final destination of the organised tour, the port of Essaouria on the Atlantic coast. 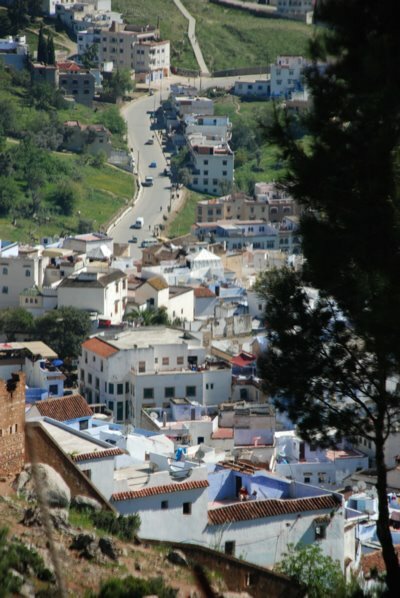 The town has a very European feel to it – lots of whitewashed buildings. We walked into the port where boats are still made by hand and many fisherman still fish from small wooden boats all painted blue. There are grills on the front where you can choose the fish you want to eat (everything from baby squid to a whole shark) and it will be cooked there in front of you. We bought some fish (no idea what it was but it looked good!) and took it back to the campsite to barbecue where we were joined by some others in the group who had decided to do the same. June also managed to find a small shop selling linen clothes which had a tailor on site to do alterations on the spot – needless to say there will be lots of linen in her wardrobe this summer! For our second and last night Ray had organized another dinner. 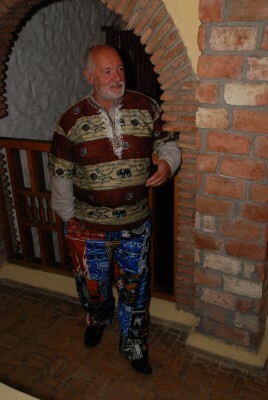 This was at the Hotel Riad al Medina which had been used by Jimi Hendrix amongst others during the 1960s. It was a good night although a little sad as we were all heading in different directions the next morning, although Ray’s choice of clothing for later in the evening gave us all something to smile about! What can we say Ray? We decided not to head straight back to Spain and along with 3 other vans, we took a more leisurely drive along the coast to El-Jadida via some roads that were… a little off the beaten track, shall we say! But despite the detour and Andy’s speeding fine, we got there in the end and spent the evening sitting around the vans eating and drinking. Having read the guidebook, perhaps we should have actually gone into the town as the old Portuguese city is a World Heritage Site. And then there were 3! Delaying the border crossing by another day we then headed to Asilah which would definitely be our final stop in Morocco as we had to be back to Calais for a crossing at 9am on 3rd May. There were no campsites here but motorhomes are allowed to park in the car park next to the walls of the old medina after a small payment to the guardien of the car park. This was another pretty village with lots of whitewashed buildings and blue shutters. One last shop before dinner where we were competing with the Chelsea vs Barcelona game for the attention of the staff! 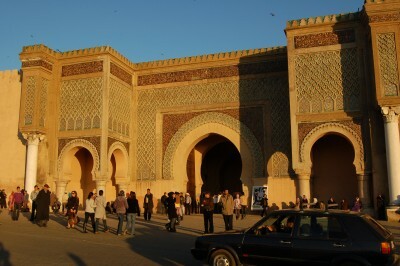 The next morning we all headed off for the border and exiting Morocco was definitely far easier than getting in! We all got back into the Spanish territory of Cueta without any hiccups and made a ferry that gave us a couple of hours driving time in Spain. The journey when back in Europe was pretty uneventful and that’s despite June taking her first turn at the wheel! Our stops on the way back were at an aire in Archdona near Granada, another in Aranda de Duero, and in France near Niort and finally Cite Europe in Calais (we avoided the aire this time! ).